In A Comparative Study of the Chinese Madhyama Agama and the Pali Majjhima Nikaya efforts are made to introduce one important section of Sarv Candon, the Madhyama Agama almost in its entirely. The Agama is dealt with very extensively, starting with the composition of the whole work in its division into varges, fasciculi, days of recital of Sutras. It also explains some difference in practices actually followed by the people of some Buddhist countries in modern times. Bhiksu Thich Minh Chau was born on 20th October, 1920. He studied at Dharmadata Ashrama in Colombo and was awarded the certificate Sad-Dharmacariya. He entered monkhook in 1946 in Center Vietnam. He obtained Ph. D. degree form Bihar University in 1961 for his thesis "A Comparative Study Between the Pali Majjhima Nikaya and the Chinese Madhyamaka Agama". He is the Dean of the Vietnam Buddhist Research Institute, Vice-President of the ABCP Organisation and Member of Parliament. He has translated many books from Pali into Vietnamese. Students of Buddhism and Buddhist culture all over the world must be thankful to Dr. Thich Mmli Chau for the most laborious and meritorious work he has produced. His work is concerned with a meticulous, detailed and incisive comparative treatment of the Pali Majjhima Nikaya with the Madhyama Agama, the Canon of the Sarvastivadins, now preserved in the Chinese translation. For want of detailed treatment, the old Agama was almost a sealed book to the majority of scholars interested in Buddhism for their lack of knowledge of Chinese. Dr. Minh Chau’s work is replete with many a surprising discovery. He has shown that this Agama and the Pali Nikãya have a good deal in common and the divergences are also revealing. He is correct, to my mind, in his assertion that both the recessions of the Sarvästivadins and the Theravadins are based upon a common heritage. Though an uninformed admirer of Pali may claim in consonance with the orthodox corn— mentators such as Buddhaghosa that Pãli tradition preserves the original doc— trifle in its strict purity and represents the actual Teachings of the Master, scholars now are critical of this tall claim. The general consensus of opinion among the scholars, both western and eastern, veers round to the proposition of Dr. Thich Minh Chau that both the versions are based upon one original text which is lost now. This work was submitted as a Doctorate thesis by the author and received unanimous recommendation of the Board of Adjudicators. His work has really extended the horizon of our knowledge He has approached the subject from the scholar’s point of view and detached attitude to promote the cause of truth and not with a set purpose to bolster up a pet dogma or the fad of sectaries. Out knowledge of Buddhism alike in doctrinal, philosophical and disciplinarian aspects, is still condemned to be narrow and sectional for want of materials. Unfortunately, the almost major part of Buddhism enshrined in Sanskrit is lost, but for the few fragments brought to light by the explorers and researchers. 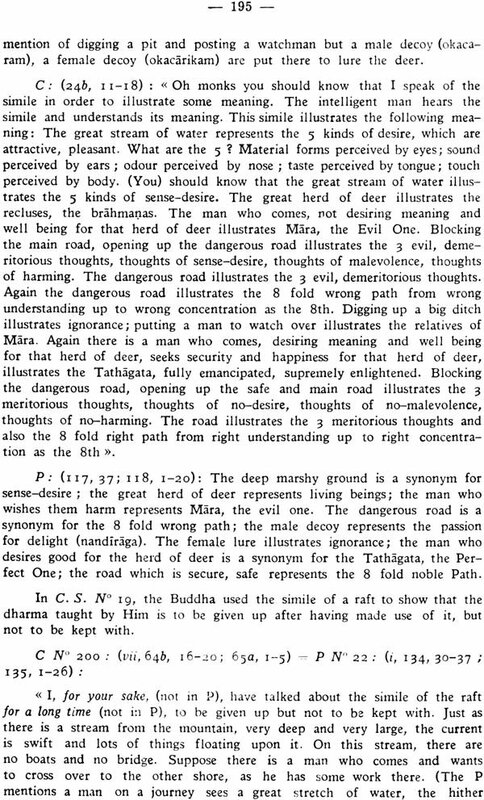 Though the quantum of Sanskrit works available is bound to compare unfavorably with that of the Pali literature, the intrinsic value of the former, and its penetrating insight and logical appraisal of problems demonstrate the fallacy of developing the mediaeval attitude of hatred and jealousy, which undermined the vitally of Buddhism in the Past. So far as loyalty to the central doctrine and tenets of the Buddha, the fountainhead of all these Buddhist Scriptures, is taken into account, it cannot now be supposed that Sanskrit Buddhism is an aberration from the pristine doctrine, These small fragments and the original Sanskrit works discovered in Nepal and Tibet have shown the invincible vitality of the Buddhist faith. Our in— sight into the secret of expansion of Buddhism in the countries of Asia is deeper and stronger by reason of our acquaintance with these treasures. It has been a puzzle to scholars how Buddhism attained to the status of world religion without the extensive backing of royal patronage and the munificence of rich mercantile magnates. Of course, such patronage came in all the same because Buddhism represented the divine in man and showed the way to transcend the animal instincts. Royal patronage was rather the result and not the condition. By its insistent stress on the transistorizes of worldly prosperity and adversity alike, it strengthens the spiritual fortitude both of the monks and laymen. It chastens the powerful and encourages the poor and down—trodden. Both mediaeval and modern history show that worldly prosperity and power are indispensable to protect spiritual advance and national tradition. Foreign conquests have devitalized the conquered people all over the world and the result was an avalanche in apostasy. The power and glory of Buddhism stem from its universal love and friendship. The Buddha conquered by love and mercy and so also his followers. The world now badly requires this philosophy of love and it is unsurprising that scholars and intellectuals are looking forward to Buddhism for the light in the darkness caused by this mad race of armaments and military power. The world is in the grip of fear and nothing can be more demoralizing than loss of self—confidence. The Buddha’s life is a vivid example of Viriya (energy) and vigilance (appamada). If we can imbibe even fractions of these virtues in our humdrum course of life, the world will turn to a better and nobler career. Dr. Minh Chau has not done anything which indirectly aimed at this objective. His work is that of a scholar, critical, cautious and faithful to the truth. But the Madhyama Agama and the Majjhima Nikaya consist of rich dialogues and parables which ennoble the soul and put us in the right path. A student who devotes his time to this work will be naturally goaded to the study of the original works which will instill in him the virtues which Buddhism puts in the forefront, The immediate result of scholarship may not be pragmatic in the broad sense. But it is not sterile. It produces results which are more powerful and permanent on account of their foundation on objective study. The application of theoretical values to life is an aftermath. Viewed in this perspective, Dr. Mirth Chau’s work will reward the labor of his students both in the short and in the long run. I am hopeful that Dr. Minh Chau will not rest on his oars or relinquish this line of research. We want a complete discovery of Buddhism and he may by his personal effort and example inspire a band of scholars to undertake the prodigious task in spite of the drudgery involved. Buddhism must be restored to its pristine glory and vitality and this can be achieved only by following up the line of work undertaken by the present author in true• missionary spirit. It causes me immense gratification that this work was undertaken and finished in the premises of the Nava Nalanda Mahavihara ; we shall always be proud of what has been done by Br, Minh Chau and his fellow—workers. When he goes back to his native home, he will, like Hsuan—tsang whose life and activities have been the subject of one of his books, devote the rest of his life to the fulfillment of his mission of propagating the perennial truths of Saddhamia for the well—being of many, for the happiness of many and for generating love and friendship by showing up the futility and fatuity of egocentric bias. About one century after Lord Buddha’s parinibbana, the Buddhist community was split into 18 schools or more ; and two schools, the The— ravada and the Sarvastivada put into shade all other schools by the voluminous bulk of their Canon and by the extensive area of their influence. But if the Ther. Canon came down to us almost in its entirety, the same cannot be said of the Sarv. Canon, the Sanskrit originals of which were almost all lost, except for some fragments discovered in Central Asia, some remains brought back from Nepal, the recent discoveries of the Gilgit manuscripts and its Chinese and Tibetan translations. A comparative study of both Tripitakas would throw a lot of light on the origin of the ancient Canon and on the similarities and differences between the tenets of the Sarv. and of the Ther,. Attempts by some noted scholars had been made in this direction ; but mostly they confined their activities to the Vinayapilaka. Thus Dr. W. Pachow in his a comparative study of the Pratimoksa and Dr. A. C. Banerjee in his the sarvstivada literature dealt mainly with the monastic rules to be followed by the monks and the runs. Dr. Bapat had opened a new vista in his Arthpadasutra by comparing the Chinese Arthapadasutra with the Pali text but his work is confined only to one portion of the Suttanipata. Thus a systematic comparative study of the Sutrapitraka of the ther. And of the sarv. Canons is still a desideratu,. My present work a comparative study of the Chinese Madhyama Agama and the Pali Majjhima Nikaya is an attempt to fill this lacuna. In this present work, efforts are made to introduce one important section of the Sarv. Canon, the Madhyama Agama, almost in its entirety. This Agama, hitherto known in its Chinese translation, is dealt with very extensively, starting with the composition of the whole work in its division into Vargas, fasciculi, days of recital and sotras (i), setting forth its doctrinal division of Sila, Samädhi and Panñã with all their minute subdivisions (a), we have also taken into account the Buddha’s life (3), the Sangha with its daily routine (4), the similes, the gãthas or verses and the conclusions of sotras (5). No details are neglected in order to give a clear vision of the essentials of the Madhyama Agama of the Sarv. Canon While dealing with the tenets of the Sarv. School some internal and external evidence are collected with a view to proving that the CMA really belongs to the Sarv. School this finding was only guessed at or alluded to be previous scholars. The high percentage of similarities between the Chinese and the Pali versions and the presence of many literally identical passages show that there existed a basic stock not only of doctrinies but also of texts agreeing in all essentials with both the Chinese and the Pali versions. Thus among the 98 C and P corresponding sutras there are 45 sutras with similar titles and 15 sutras of almost the same locations and 15 sutras of almost the same locations (2) the treatment of the fundamental doctrines such as the Satipathana the eightfold Path the Jhanas of the Rupa wording of some passages can eb said to be identical in both versions. All canon referred to by windternitz in his history of Indian literature (4) Prof. Andre Bareau accepting the existence of such canon writes. The whole part two from chapter 1 to Chapter IX is entirely devoted to a minute comparative study of the Sarv. And the Ther. Doctrines and traditions and thus it serves to show on the one had to what extent the similaries go and on the other hand what the marked differences between the two traditions are. The chapter on the Sarv. And the Ther. Characteristics (5) can be said to be the summary of the whole work in which peculiarities of each school are assembled together and explained. It aims also at explaining some differences in practices actually followed by the people of some Buddhist countries in modern times. 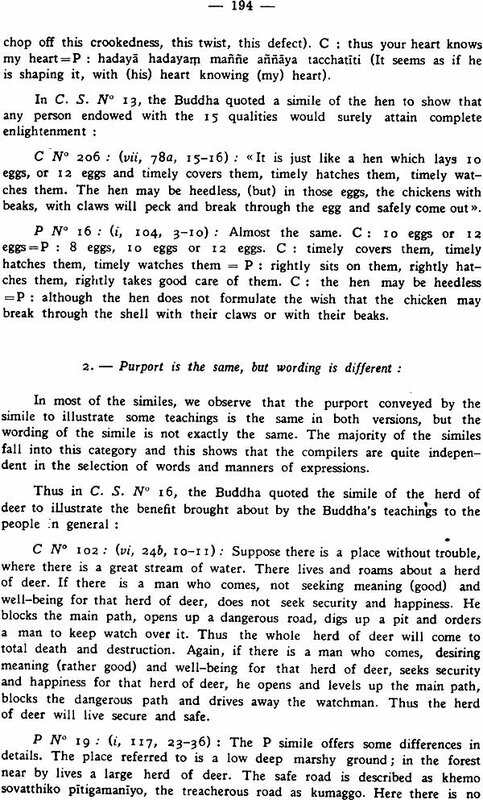 The high percentage of the similarities testifies to the high authority and reliable fidelity of the Pali transmission as apply expressed by windternitz the more this Buddhist Sanskrit literature is opened up and the more minutely it is compared with the Pali Canon the more it is proved the Oldenburg is right when he says: the Pali Copy though naturally not of infallible accuracy must still be judged as eminently good (i) the divergences thus collected when scanned with sufficient attention show the deliberate hands of the compilers who added texts portions of texts and details which suited the tenets of their respective school and suppressed those which were found antagonistic to them. Thus for instance was reported to allow the monks to partake of the 3 kinds of meat (2) while the Pali omints reference to the existence of the suffering in the past in the present and in the future (3) this shows how rightly Dr. N. Dutt observed the Pali Pitakas undoubtedly passed through several redactions with accretions and omissions till the texts reached the form in which we have them now. The artificial and stereotyped form of each sutta takes away the original freshness of the sayings and distinctly reveals the clipping and shaping hands of the redactors of a time far away from the time of the teacher (4) of course the same should be said of the Sarv. Canon. The present works serves also to illustrate the magnificent and pioneering work done by Sanghadeva and Indian monk from Kashmir to spread Buddhism in China. On Prof. Andre Bareau’s suggestion I have collected enough Pali and Chinese equivalents so as to compile a small glossary of Pali Chinese English equivalents but the lack of space in this work couples me to reduce it to a minimum. While going through this comparative study of the CMA with the PMN I cannot resist having the impression of treading on an almost virgin soil as few systematic works have been done so far in this field of Buddhist literature. Chizen Akanuma in his The Comparative catalogue of Chinese agamas of Pali Nikayas made the first attempt to compare the Chinese Agamas and the Pali Nikayas but his work although greatly impressive and of vital importance is confined only to cataloguing the titles of corresponding sutras and does not go into the details of the work itself. A.F. Rudolf Hoernle in his Manuscript remains of Buddhist literature found in eastern Turkestan has tried to make a systematic comparative study of the Sanskrit fragments found in central Asia with their Pali corresponding sutras but as far the Madhyama Agama is concerned only fragments of two sutras the Upalisutra and the Sukasutra are found and they are too fragmentary and too scanty to allow of a comparative evaluation. To my enquiry whether any western Scholars have done anything on my subject Prof. Andre Bareau a noted French scholar wrote that there was a group of German Scholars under the leadership of Prof. Waldschmidt of berlin who have been working on the remains only of the Dirgha Agama and of the Samyukta Agama but not of the Madhyama Agama. As far as the Japanese scholars are concerned, I learned from Prof. Sakurabe that from time to time some Japanese scholars had written articles on the CMA such as Prof. Sakurabe himself, Prof. Chizen Akanuma, Dr. Mochizuki etc… but their works which are mostly in Japanese cannot reach all the readers at large and are confined to one or two aspects of the CMA only. Thus a work which deals with a systematic comparative study of the CMA and the PMN as a whole has remained yet a desideratum.